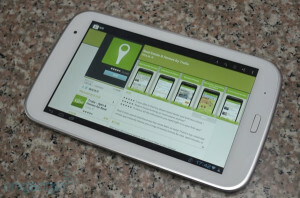 Hyundai’s new Android Tablet is named as T7 and is built with a good amount of technology underneath it. The company, known as Hyundai Electronics has been in the mobile phone manufacturing space for the last few years and into the Android scene for a while too. The T7 is a 7 inch Android Tablet and is powered by a Samsung Exynos 4412 processor and 1 GB RAM under the hood. It comes with 8GB of internal storage along with a microSD slot for expansion. The 7-inch display has a maximum resolution of 1280×800 and on the multimedia side, has a front facing camera and a rear camera fitted along too. 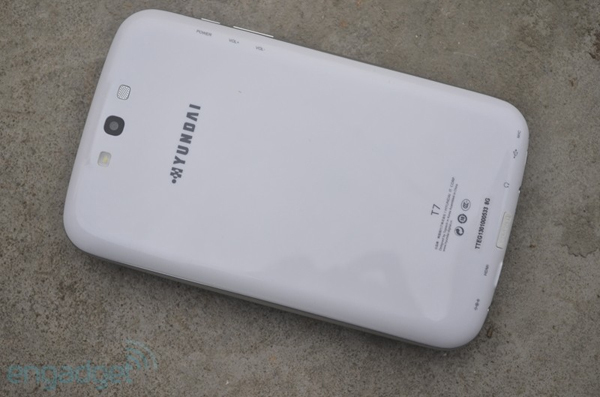 The recent images which have been leaked give us leads in which the device seems to look very similar to the front facing portion of the Samsung Galaxy S3/Note II, especially the home button that’s placed in the front. The rear design in terms of the camera and the flashlight placing is also similar to the Samsung Galaxy SIII in terms of positioning. The pricing of the 7-inch tablet is from Hyundai is at 165$ and it does seem to be a good price going by just the spec list of the tablet, however the build quality from Hyundai is not very recommended.